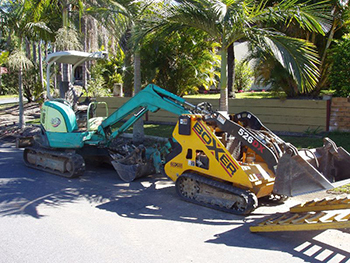 PB Earthworks is recommended as one of the best earthmoving and excavation contractors in Gold Coast, Brisbane, JImboomba, Parkridge and Cedarvale. We proudly work for both commercial and residential properties. We are a family owned business and we pride in our work. With 12 years of experience our experts have gained extensive knowledge and expertise in their work. Our experts are well trained and work efficiently to meet customer expectations. Our goal is not to be the biggest, but to be the best at what we do. We are focused on developing strong customer relationships and completing every project to the highest of standards. With an emphasis on the environment we endeavor to use recycled materials where possible and work most effectively to limit our environmental impact. 1. To deliver projects on time and on budget. 2. To provide reliability, quality and safe work practices on the projects we undertake. Our focus is committed to providing a top notch quality based service that exceeds our customers’ requirements and expectations in a professional and cost effective manner.We work efficiently in a wide range of environmental settings and provide a healthy and safe work environment for our customers. We endeavor to provide the best quality service to entire client community. Based in Brisbane, we have built a successful customer base on our reputation of being reliable, honest and cost effective. We aim to complete the work in minimal time without compromising safety or quality. Our experts understand the value of time and money and so provide a quality work for our entire clients so that they save time and money. Contact us now for further information on details. We are ready and happy to assist you with! !